We Provide Complete Ultrasonic Inspection Services. Our inspection service will save money and provide system reliability assurance. Save money with Leak Detection. Economical and Effective. No production interruption. Designed to save money, fast. Guaranteed Payback! This non-intrusive service identifies ALL compressed air and gas system leaks. Cost of air can be reduced, dramatically. 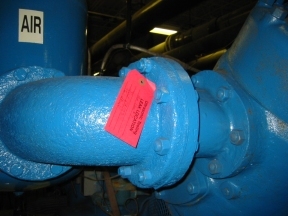 A combined leakage area of only 1/8 of an inch will waste over $2000 in costs over a year. At 100 psi, 5 cents per kWh. Our ultrasonic service detects even the smallest leaks. How small? We can detect a .004" diameter leak @ 10 psi at a distance of 50 feet! Ultrasonic leak detection is completed during normal operating conditions. No shut downs or production interruptions required. All leaks are tagged, documented and a complete report is included. Each report includes an estimate of how much the total of all leaks is costing your company. Take a moment and just imagine how many small, even microscopic leaks are on your plant's air system right now. Every single one of those leaks are blowing money into the air and making your compressors work harder than they need to. Our Ultrasonic Leak Detection Service sniffs out even the smallest leaks. All leaks are tagged and locations are recorded. A complete report is delivered that includes all leak locations photographed and documented. Locate damaging and dangerous high voltage corona. Tracking and arcing detection service. Available with Infrared Inspection. We find it first! Corona Discharge: Occurs when air molecules around conductors become electrically charged or "ionized". Loss of energy, deterioration and failure of insulators result. Arcing and Tracking: Voltage tracking and arcing in electrical supply systems is often hard to locate until it is too late. Let us find and monitor these conditions on your system. Proven results. Ultrasonic Electrical Service: A Boldstar Infrared Services Inc. inspection utilizes both infrared thermography and ultrasonic detection techniques to locate problems on low voltage and high voltage distribution systems. A Boldstar inspection pinpoints unwanted conditions BEFORE unwanted results occur. Our expert technicians, your equipment and benefit. Maximize your maintenance dollars. Electrical and mechanical ultrasonic inspection advantages. Steam trap surveys. Routine Inspection Discounts. Passing Valve Service. Boldstar provides ultrasonic predictive maintenance services. We combine ultrasonic and infrared thermography to provide an unmatched maintenance inspection service. Our inspection service will save money and provide system reliability assurance. Electrical arcing, tracking and corona detection. Bearings, commutator brushes, gears, clack-valves, steam traps. Pressure and vaccuum leak detection, tanks, pipes. Exhaust system leaks, heat exchanges, boilers and condensers.